We've had it happen... you get in the car or truck... inserted the key... and are greeted by a deafening "click click click"... then silence. Many times the battery is the culprit but, just as often, the starter has failed. The starter is a simple electric motor that uses direct battery power to engage the flywheel and turn the engine to start it. This is a simple circuit and there are a limited number of possible causes for a starter failure. Bad Solenoid- The solenoid is usually mounted to the top of the starter and is an electromagnetic switch that supplies the power to turn on the starter motor. When the internal contacts wear out, or the winding's in the electromagnet short out, the solenoid won't engage the starter motor. 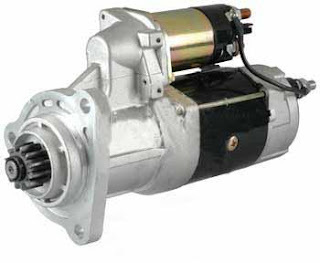 Bad Starter Motor- The starter motor is a powerful DC motor and just like any other DC motor, the brushes and bearings in them wear out over time. Loose Connections- The positive battery cable in most vehicles feeds direct battery voltage to the starter. If the connection becomes loose or otherwise compromised, the starter won't have the available power it needs to start the engine. Oil Leaks- Hot engine, power steering, or transmission oil leaking on the starter can work it's way inside the starter and cause the protective coating on the motor winding's to soften and degrade. When this happens, the stater shorts out and can not do it's job. Simple repairs like fixing oil leaks and proper battery maintenance can go a long way to preventing premature starter failure. Come to Kool Kar Auto Repair for all of your starting and charging system repairs.